On November, 7th, 2010 the new album of Polish musician Pleq (Bartosz Dziadosz) under the name «Sound Of Rebirth» was issued. If to trust Discogs, it already its the eleventh longplay work for three years of existence of the project. Frankly I was always a little alarmed similar artists, but with Pleq apparently a different situation. 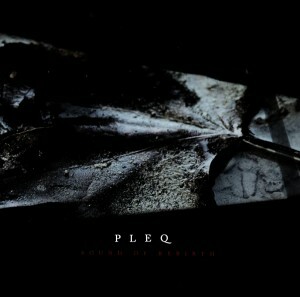 Yes, in his creativity it's possible to hear influence of such known projects as Murcof, Julien Neto, Arovane or Proem and, despite at first seeming secondariness, Pleq nevertheless completely grasps your attention practically from the first sounds. Probably all business in that as Bartosz presents it to us. In the «Sound Of Rebirth», and in other of his albums, there is some sort of its own inherent only Pleq, unique atmosphere. A bit sad, a little mysterious and occasionally dark. The considerable merit certainly in it belongs to vocal tracks («Raindrop», «Black Dog» and «The Robot Can't Swim») which, in my opinion, are pearls not only this record, but also probably all genre as a whole. Opening «Black Dog» meets us disturbing and almost colloquial voice by Emi Hosokawa, immediately setting up a listener on the right mood. Tracks «Hackneyed Words» and «Integral» though already also has been released on the previous albums, nevertheless perfectly fit here. Gloomy ambient textures add a fraction of mysticism and stained with an album in the night tone. Such things as «Oyasumi Nasai», «On Your Way», «A Very Gentle Death» with their minimalist keyboards, lonely-sounding in a emptiness, just remind creativity of above-stated Julien Neto and early Murcof. Modern classical is same trend as dubstep and there's no getting away, another thing is that the quality of performance in Pleq at the same high level. Close the album had become already traditional for many labels remixes from other musicians. In my opinion among them there aren't sounds better originals, but it will be interesting to listen interpretations from Tapage, Nebulo and Spyweirdos .